402 in stock Need More ? 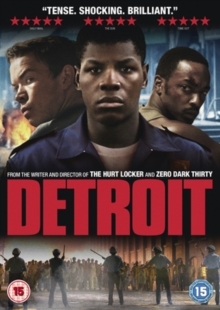 Kathryn Bigelow directs this crime drama which focuses on the 1967 Detroit riot and the subsequent Algiers Motel Incident. When police raid an unlicensed bar on Detroit's 12th Street their overzealous handling of the bar's African-American patrons sparks a violent retaliation from the large crowd of angry observers. The disturbance quickly escalates into days of looting, rioting and widespread violence across the city, overwhelming the Detroit police force and leading to the Michigan State Police and National Guard being called in to quell the trouble. As acts of violence continue to erupt across the city, officers respond to reports of fired gunshots at the Algiers Motel, where many have sought refuge from the riots. The cast includes John Boyega, Will Poulter, Kaitlyn Dever, John Krasinski and Anthony Mackie.